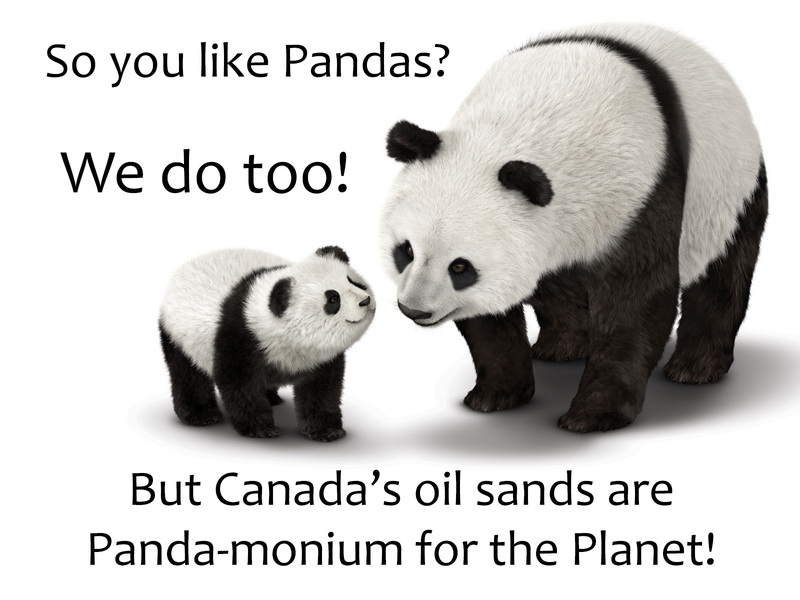 Canada's oil sands are Panda-Monium for the Planet! On May 18th, members of Toronto350 went to Toronto Zoo to raise awareness and bring attention to how pandas are affected by climate change. Canada and China are big contributors to climate change, which threatens many species—including the panda. Recent research has determined that it will substantially reduce the availability of their food in the wild by 2100. Canada’s climate performance is the worst in the entire western world* and China is the largest emitter of greenhouse gas pollution on Earth. Together, Canada and China are forming an “oily” relationship, heavily invested in expanding the Alberta oil sands—the dirtiest fuel on the planet. Oil sands extraction is not only putting Canadians at risk, it’s also endangering the panda. A better future is possible. We need your help! Toronto350 is a group of volunteers who are working—with many others—to solve the climate crisis. Join our mailing list at toronto350.org. * The tar sands are changing our climate, land, air, water, & communities, yet few Canadians know the truth. It's time for a #realityCheck. tarsandsrealitycheck.org. China's loan of endangered giant pandas to Canada highlights the importance of rare species, and the need for international cooperation to protect them. Unfortunately, both Canada and China are failing to deal with the problem of climate change. To prevent dangerous climate change the world must phase out the use of fossil fuels, but both China and Canada are exploiting vast reserves, adding huge amounts of greenhouse gas pollution to the atmosphere. This behaviour threatens many endangered species including pandas. Canada and China should cooperate to limit the seriousness of this global problem and protect species including pandas. The Intergovernmental Panel on Climate Change (IPCC) has highlighted the risks posed by climate change to Earth's biodiversity. In their Fourth Assessment Report (2007), the IPCC concluded that with over 1˚C of global temperature increase, up to 30% of the world's species will be at increased risk of extinction. Above 4˚C of warming, "significant extinctions around the globe" are expected. Current Canadian and Chinese climate change policies are driving us toward even higher levels of warming. Both countries continue to expand the use of coal and unconventional fossil fuels and fail to make adequate investments in low- and zero-carbon forms of energy. Other research published this month concluded that: "without mitigation, large range contractions can be expected even amongst common and widespread species, amounting to a substantial global reduction in biodiversity and ecosystem services by the end of this century". Climate change poses a specific danger to pandas. If it continues unabated, between 80% and 100% of livable panda habitat will disappear from the region in China's Qinling mountains by the end of the 21st century. If pandas are to have a bright future, more must be done to constrain fossil fuel use and the climate change it causes. In order to protect the Earth's biological richness and the potential of all people in the future to live prosperous and healthy lives, we the undersigned call upon the governments of Canada and China to rapidly implement plans to control greenhouse gas pollution and limit global climate change to under 2˚C, through the stabilization of the atmospheric concentration of carbon dioxide below 350 parts per million.